This tutorial demonstrates how to write into the Log file, manage Logs , and create custom categories for logs. You can use the Log stepin the Decisions Flow Designer for debugging purposes. This step can be found in the Flow Designer under Flow Management > Debugging	. In this example, create a simple Flow with a Log	step. In a Designer Folder begin by clicking Create Flow	button on the Folder Actions Panel. Then, Name	the Flow and click Create	to proceed to the Flow Designer. 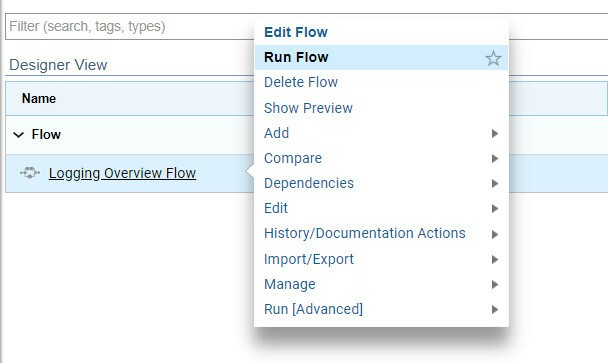 In the Flow Designer, add a Log	step from the Flow Management > Debugging	category. Connect the Log	step to the End Step	in our Flow. Click the Log step, then on the right side click the Properties	tab. The Type setting lets you configure a log level in descending order of importance: Debug, Info, Warn, Error, Fatal. By default the tool displays only the Warn, Error,	and Fatal	types under System > Administration > System Tools > Logging. For testing purposes, set the Type to Fatal. TheCategory	setting lets you set a category for your logs for easy identification. Often, best practice is to use the name of your Flow or project for the log category. UnderInputs,	the Value	property lets you configure the contentof this Log. It can be either a constant value or dynamic data from the Flow . 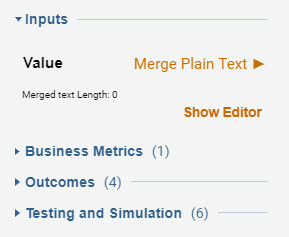 In this example use the setting Text Merge.Plain	and click Show Editor	to compose the text. 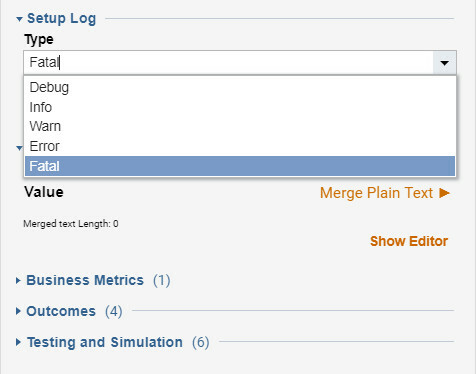 In the Merge Text Editor compose a simple message and add the FlowTrackingId	value from Flow Data . Click SAVE	to save and continue. Back in the Designer Folder, right-click the Flow and click Run Flow	to run it. To check the log, click System > Administration > System Tools > Logging. The log is also written to the file system in C:\Program Files\Decisions\Decisions Services Manager\Logs\Primary.txt	(Note: the location may be different in the file system if you did not use default Decisions installation). Open Primary Log	file, find the Message from the Log	step. A custom category file is also created by default. Log Categories	are powerful in organizing Log messages. 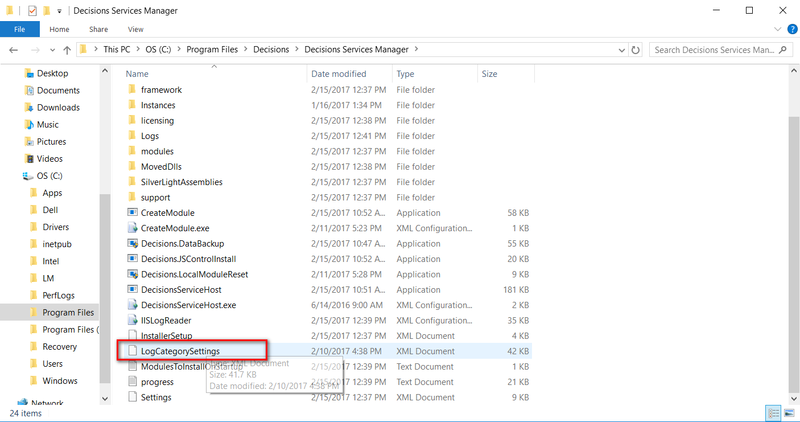 Categories can be configured and created in the LogCategorySettings	file that is located in *C:\Program Files\Decisions\Decisions Services Manager*	folder. In the LogCategorySettings	file, notice a new category has been automatically created. The name of this category was set in the Properties	tab of the Log	step in our flow. In this file manually set the Log Levels	or set logs in this category to be written to the separate file (changing the LogToOwnFileName	from false	totrue). To test this, return back to the Portal and run our Flow. To do this, right-click on the flow and click Run Flow. 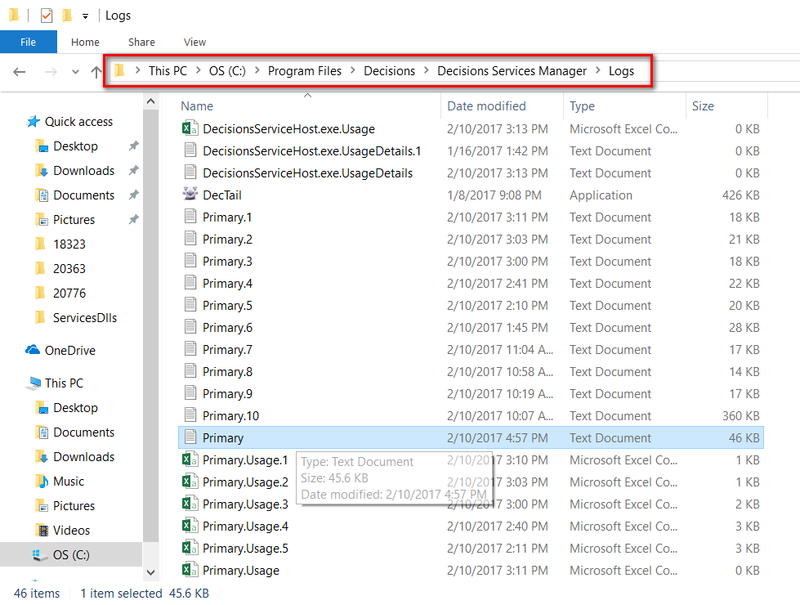 Once the flow has run, navigate to the C:\Program Files\Decisions\Decisions Services Manager\Logs	folder and locate ‘Logging Overview Flow’	log file that was created with the Log step in our Flow . This file contains the Log message that was in the Primary log file previously. Global logging settings can be configured in Settings.xml	file that is located in *C:\Program Files\Decisions\Decisions Services Manager*	folder. You can also change logging settings in the Portal under System > Administration > System Tools	> Logging	. This folder contains the Server Log Viewer	and Client Log Viewer. To change logging settings on this folder, right-click and click Server Log Categories > Enable/Disable	.